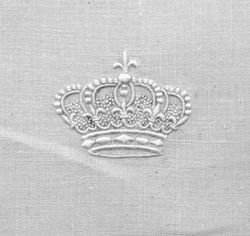 A simple embroidered crown symbolized nobility in Europe. It can be accompanied by letters or more sophisticated adornments such as a coat of arms or the family's motto. The United Kingdom had a very precise set of rules pertaining to crowns and coronets for the lower ranks of peerage. In continental Europe there are many different traditions. 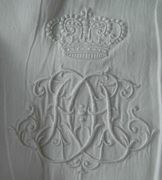 Ducal crown with "fleur de lys" ( symbol of the French monarchy) used to monogram a comte de Paris tablecloth. End of 19th century. 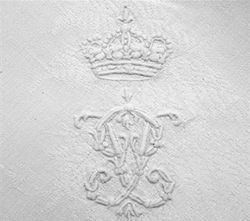 Ducal crown and double monogram LP for Louis Philippe d'Orl�ans, first comte de Paris. Spectacular embroidered comtal crown and coat of arms with two lions and three cathedral towers!! Marquis' crown hold up by two angels. 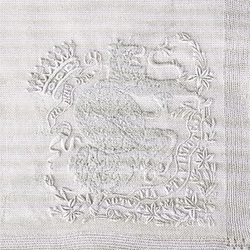 Above the crown, the motto " Godefidus atavis dedit" is finely embroidered. 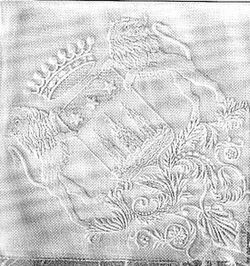 Comtal crown, coat of arms with two lions one upright and one lying down. 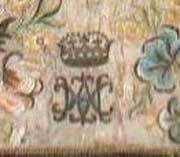 Two embroidered mottos: " Potentia et virtute" ( power and courrage) and " an plus dru"
Embroidered marquis' crown with a quadruple monogram MPPS adorned by large fleurs de lys. 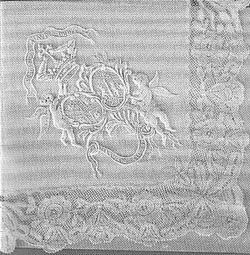 Second half 19th century. 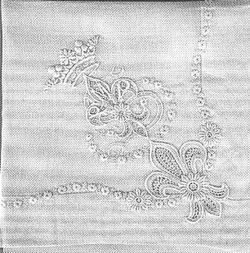 Episcopal crown and monogram on this chalice veil, 17th century.